When we, that is to say you, approach a work like Moods, by Yoel Hoffman, you have to be prepared to relinquish everything you expect a novel to be. You will encounter a story, no many stories, and stories within stories, working their way in and out of 191 micro chapters. You also have to be prepared to walk, lockstep, for the most part, with the author who invites you to join him under the umbrella of the third person plural–not the royal “we”–but something much more intimate except, of course, when it makes no sense to speak in the plural and the author has to step aside and admit that, by “we” he means “I”. Confused yet? Don’t be. This has to be one of the most infectiously readable pieces of experimental fiction that you can imagine.
. . . my father (Andreas Avraham) hides from Francesca, my stepmother, records he bought because the money he receives (in transparent bills) isn’t enough for her. The music he listens to consists of a single sound, like the straight line on the monitor when the hearts stops beating. The scent of eternity is like that of goulash. Everything’s frozen over. Jokes one tells are revealed in full like that famous rainbow arched through a cloud. Each season extends to infinity. You stand there, and the streets run beneath you. Women lie down forever. A faint soft sound like the fur of a foal (of a donkey) wafts through the air, and the colours are all pastel. It is a book, as the title tells us, of moods. And the mood that permeates this work is one of sadness. It is smelled in stairwells and trapped between the crumpled covers of physics textbooks. It is the sadness of missing loved ones, whether they have gone away or have died. There is a wide arc of time, reaching to eternity in its metaphysics, spanning some seven decades in the real life of the author (and vicariously for his reader companion). The reader can no doubt guess what sort of music we’re trying to compose. Mostly blues. The sentimental melancholy suits us as a suit fits a tailor’s dummy. If someone asks us to look at something rationally, in a major key–as, for instance, Tellmann did–we get angry. Hoffmann is an Israeli writer born in Romania in 1937. The history of his people, family members and friends, comes through as he writes about those he has known, but his worldview transcends religion and political boundaries. Hoffmann, a former professor of Japanese Buddhism at the University of Haifa, spent years studying in Japan, living for a time in a Zen monastery. His knowledge of and sensitivity to the Japanese koan, sets the tone for the questions he asks and the observations he makes, whether he is pondering the nature of the universe or the order of names in a phone book. We can now reveal to the readers of this book a deep secret, but they’re not allowed to reveal it to readers of other books. Feet follow one another. Hands cut through the air. The mouth opens and closes. The inner organs expand and contract, according to their nature. What’s outside is standing or walking. Prayers can be heard everywhere, whether a person says them aloud or not. Frogs need only themselves. The marsh reeds know the right direction. And because these things are set forth here, it’s a wonder this book is sold for so little. So what to make of Moods? Novel or autobiography? The short chapters, most no longer than a couple of paragraphs, sometimes follow thematically or chronologically. Characters appear and reappear. Anecdotes lead to reflection which in turn to leads to metafictional contemplation about the nature of literature in general and fiction in particular. Hoffmann is skillfully and enthusiastically playing ideas against one another. It is both funny and emotionally engaging. Unlike many postmodern works that are so unabashedly metafictional in nature–that is novels that dissect the novel you are reading as you read it– Moods is infused with warmth and humanness. It pulls a reader in and treats him or her with a respect that is, Hoffmann would argue, with some seriousness, a responsibility for which a writer should be held criminally liable. And although sadness is the underlying mood, reading this book is, quite simply, a joy. 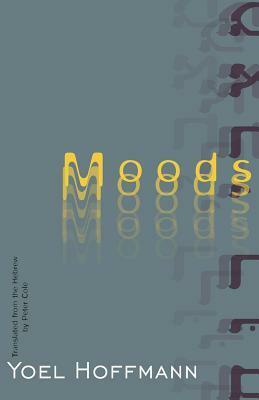 Moods is translated with poetic sensitivity to the flow of the language and the linguistic playfulness by Peter Cole. Published by New Directions who have, over the years, published most of Hoffmann’s novels, Moods is a shortlisted title for the 2016 Best Translated Book Award. 1951. In an apartment on the Rue Delta in Alexandria, a young boy plays a game to wile the hours away, recording and cataloging the makes and license plate numbers of the cars that pass on the street below. Inside, his mother, grandmother and an assortment of matrons gather and gossip over a game of rummy. Tourists flock to the city, to the beaches and warm waters. A rich mixture of languages play across the tongues of residents and visitors alike. But on the ground tensions are building, political frustrations run deep, threatening to fracture the tentative ties that have bound Muslims, Jews and Christians in this cosmopolitan playground. For thousands of families clinging to a fragile petit bourgeois existence, this may be one of the last glorious seasons of romance, horse racing and cool drinks served by discreet and obliging servants. 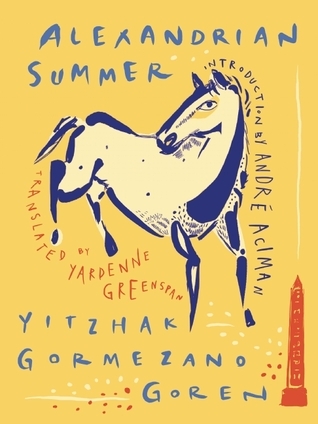 From the opening pages of Alexandrian Summer, the newly translated novel by Israeli author Yitzhak Gormezano Goren, the author’s deep affection for the city in which he spent the early years of his life is unmistakable. His narrator makes it clear that the story he is about to share is, in fact, his own. He is that 10 year old boy watching the cars pass. But he debates how best to tell the tale, admitting that he is looking back with the perspective and wisdom of an adult. First person, third person, real names, fictitious identites with the standard disclaimer? He opts to shift his focal length, like a photographer adjusting the depth of field of his lens, moving in and out of a series of scenes that collectively recount the visit of the Hamid-Alis, family friends from Cairo, who have come to spend the summer. Young Robby does not know it at the time but by the winter his family will leave for Israel. It is his mature self who is able to look back and sift through the events of his final summer in this magical city. Through Robby and a colourful canvas of characters – immediate family, extended family, friends and neighbours – he unfolds a story that is at once intimate and personal, and part of a broader political sea change. From the moment that the Hamid-Alis pull up in their Topolino, an aura of glamour descends on the apartment on the Rue Delta. The father Joseph, a small man with his characteristic fez, is a former jockey who tasted fame and glory until the sudden and tragic death of his beloved mare. But rumours persist that, in his Turkish blood is a Muslim past that he abandoned to convert to Judaism when he fell in love with Emilie, his full bodied and patient wife. David Hamid-Ali, their 17 year-old son, is a perfectly pressed and groomed specimen of athleticism, a rising star on the horse racing circuit who has been groomed to take on his father’s sport. But the dedication is dependent on a strict diet to combat the tendency to weight gain inherited from his mother. And the one true desire of his heart, Robby’s older sister, is playing with his emotions. Finally the youngest son, 11 year-old Victor, is overlooked by his parents, subject to frequent pummeling at the hands of his older brother and, thus neglected, he occupies himself by engaging in sexual play with Robby and his friends. By the time they climb back into the Topolino to return to Cairo, the Hamid-Ali family will be reduced, weakened and irrevocably changed. Before long Egypt and Alexandria will also undergo a revolution. By evoking small snapshots of the emotions, interactions, observations and events of this steamy summer, Gormezano Goren paints a heartbreaking and tender portrait of family dynamics complete with his own “Greek chorus” of rummy playing matrons. At the core of this story is the racetrack rivalry between David and the lightening fast Muslim jockey Al-Tal’ooni. Although he triumphs in the first race of the season, David’s loss in the second begins a series of conflicts between father and son, and spiraling self doubts and depression in the aging Joseph. Against the backdrop of a legendary city at a moment when the life that the Jewish and other European residents is about to unravel and dissolve, this one last summer blends the nostalgia of childhood with the disillusion of age to create a timeless tale, beautiful and sad. Originally published in Hebrew in 1978, Gormezano Goren worked closely with translator Yardenne Greenspan to prepare this first English edition. In an interesting essay on Lit Hub, he recounts the challenges of preserving the polyglot quality of discourse in Alexandria and the value of being able to revisit the original text after so much time. Alexandrian Summer is published by New Vessel Press.